Britain went mad on Wednesday evening and Thursday morning with panic buying for petrol after government ministers urged motorists to take sensible precautions and top up their tanks. The warnings came after the union Unite balloted for a strike of its tanker drivers who deliver fuel to more than 90% of Britain's forecourts. As millions of motorists queued for petrol social networks filled with comments. Petrol and queues became the top trending subject on Twitter with many posting jokes relating to other recent news items. "Just filled up with petrol, bought 1000 cold pasties and 10,000 stamps! This government will never bring me down!" joked one Twitter user, referring to the hikes in first class stamps and the scandal surrounding the so-called 'pasty tax row'. "Where am I supposed to store all this petrol? The bath is already full of stamps and pasties," another quipped. The jokes came in thick and fast, particularly over Francis Maude's suggestion of storing jerrycans of fuel. "Filled the car with petrol. Opened the door and it all came out again," one tweet read, while another said, " It may be wise to actually fill your car up with petrol though make sure your windows are closed first!" Some were just a little cynical of the government advice, suggesting it was just a way of getting people to spend more money. "Tricking people into bulk buying stamps and petrol in the last week of a 2nd negative quarter is a great way to avoid a technical recession," one person posted. Another Twitter user sacastically suggested the advice was a good move. "Congrats to the politician who created this mass petrol panic. He might just have single handedly got us out of the recession." While long queues were evident in many areas, this was not the situation everywhere, though some social network users wondered if the panic over petrol might encourage some to take a day off. "I wonder how many people use the excuse 'no petrol' to not go into work today," one tweet said. In fact some Twitter users were actively encouraging people to enjoy the sunny weather. "Stop buying petrol and do a bit of sunbathing instead,it's great outside," @tonyblackburn urged his followers. There were some more serious tweets floating around on Twitter. 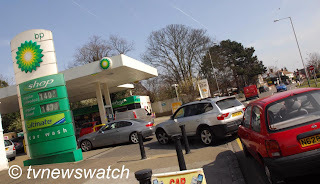 The London Fire Brigade called on motorists not to overfill their tanks after being called to several fuel spillages at petrol station forecourts. "Drivers, please take care not to over-fill when topping up at the pumps," a much re-tweeted message read. China increase military to "win local wars"
Are China and India about to go to war?